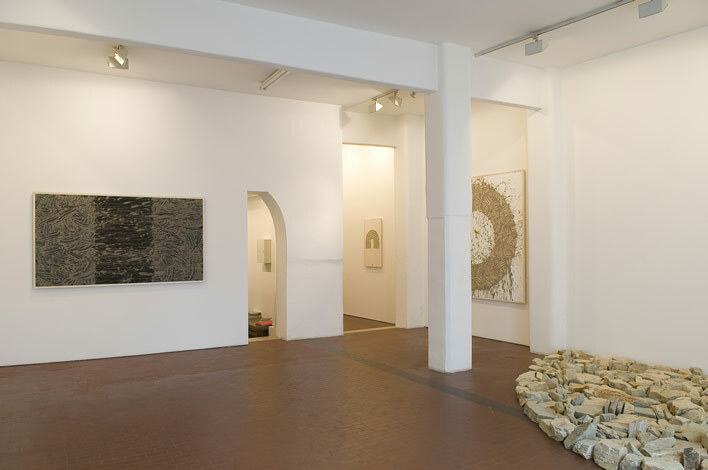 Galleria Lorcan O'Neill Roma is pleased to present, for the third time in its space here, a show of new works by Richard Long. Richard Long has been recognised internationally as a leading figure in the development of Conceptual Art since the late 1960s when he generated his own artistic practice: creating seminal works that embrace and remark the interaction of man with nature. Walks across various terrains throughout the world inspire and provide natural contexts for the artist to create the sculptures and leave signs of his encounters with the landscape. Photographs, text pieces, stone sculptures and mud works extend his sculpture’s methods and materials in the gallery’s space. They are documents of Richard Long’s walks around the world, according to his statement “walking as art”. The show in Rome wants to represent his wide variety of methods with new works especially conceived for this space. In the main gallery’s space there is a semi-circular stone sculpture made by himself with local stones: Italian quartzite which is a hard and sandy stone; the colour is usually white to grey and often occurs in various shades of pink and red. Long uses the stones in different geometrical patterns. These primary shapes are used as a symbol of universal culture and they are always related to the host place through the materials and also related to the relationship between nature and human being. There is a wide variety of mud works on wood panels literally made in the gallery. For a week the gallery has been his studio. Natural materials, as water and ground, mixed with primitives geometrical shapes like circles, lines or cascades have been drawn by his hands following the Earth’s and Cosmos rhythms. It’s a representation of this symbiotic relationship between the artist and the paintings, between physical and spiritual, between Nature and Art. The title Gravity refers to the possibility for each of these paintings to be seen in different ways; the viewer looses the orientation of the physical work and plays with the mysterious of Nature.